LONDON--(BUSINESS WIRE)--Technavio’s latest market research report on the global cloud-based information governance market provides an analysis of the most important trends expected to impact the market outlook from 2018-2022. Technavio defines an emerging trend as a factor that has the potential to significantly impact the market and contribute to its growth or decline. According to Technavio market research analysts, the global cloud-based information governance market will grow at a CAGR of close to 20% during the forecast period. The increased use of the Internet for day-to-day activities and critical operations is one of the major growth drivers of this market. Companies are offering storage services in the cloud, which is leading to the storage of critical information on the web. Furthermore, banks and payment card companies are encouraging customers to make online transactions and payments using the Internet. Even though online methods have benefits over the traditional methods, there are high-security risks in such transactions. Cases such as data thefts and phishing are on the rise, and new forms of attacks are emerging. The adoption of cloud-based information governance solutions helps organizations to improve efficiency and productivity. This helps them to meet the demands in their business quickly and remain competitive in the market. One of the most significant trends in the IT services industry is analytics. Companies are adopting analytics services to transform the unstructured data gathered from various online channels into structured data to get meaningful insights. To analyze data, advanced analytical tools such as predictive analytics is used to understand the pattern related to business and consumer behaviors. Industries such as BFSI, retail, telecommunications, and healthcare have benefited from analytical tools to take key decisions at organizational levels to improve customer service. “Most of the enterprises are witnessing a rise in the volumes of the data generated due to the adoption of advanced technologies and cloud services. To get a competitive advantage in the market, companies are increasingly focusing on analyzing and using this data in a timely fashion. Such companies are recognizing the prospect of big data and designing their IT strategy to capture such opportunities. For example, big data enables the government banks to spot fraudulent transactions. Globally, governments are dealing with the digitization of information such as the digital records of citizens to know more about customers. In the future, the demand for cloud-based information governance is expected to be high as the emergence of analytical tools leads to high data security,” says a senior analyst at Technavio for research on cloud computing. This market research report segments the global cloud-based information governance market into the following end-users, including BFSI, public, retail, manufacturing, and IT and telecom and key regions, including the Americas, APAC, and EMEA. The BFSI segment held the largest market share in 2017, accounting for nearly 19% of the market. The market share for this end-user is expected to decrease by 2022. The fastest growing end-user is IT and telecom, which will account for nearly 13% of the total market share by 2022. The Americas was the leading region for the global cloud-based information governance market in 2017, accounting for a market share of nearly 67%. By 2022, APAC is expected to witness a monumental growth rate of nearly 7%. 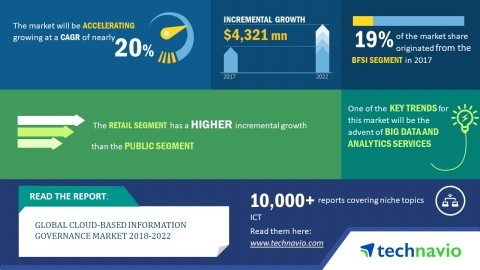 Technavio’s latest market research report on the global cloud-based information governance market provides an analysis of the top trends and drivers.